Dual USB Wall Charger and 6FT Micro USB Cable: Wall charger compatible with any USB-enabled device-iPhone X/8/7/7 plus, Samsung, LG, HTC, Nokia, Sony. 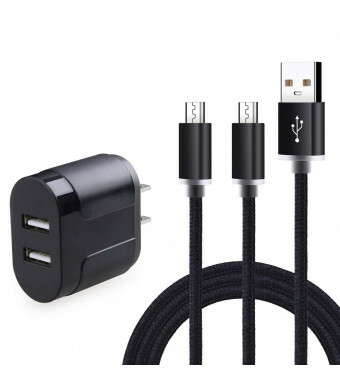 Micro USB Cable compatible with any Micro-USB connecting devices-Samsung Galaxy S7, S7 Edge, S6, S6 Edge, S4, Note 4 5, Tablet, LG K20 K20 Plus V10, LG Stylo 2/3 Plus, Google, Blackberry, Sony and other android device. Micro USB Charger: Tangle-free nylon braided coat cover with sturdy ultra compact connector can bear 6000+ bending test, and increasing durability extend the life of cords long. 6FT length is optimized for using with hard-to-reach USB ports and out-of-sight wall chargers. You can use them in office, car, home, and hotel or anywhere you require cables. No worry again for the short length of cables. High Performance: Dual-USB output with total current 5V/2.1A and input with 100-240V enables you to charge two mobile devices simultaneously at high speed, automatically detects your devices to deliver optimum charging speed. Double Wall Charger: Home charger adapter allows charging at home or in the office via USB cable connection. Simply plug in the USB cable, and plug the adapter into the wall. Compact, lightweight, portable, stylish, easy to store. What You Get: 1 X Dual USB Wall Charger with 2 X 6FT Nylon braided Micro USB Cable, 12-Month warranty, reliable and friendly customer service. 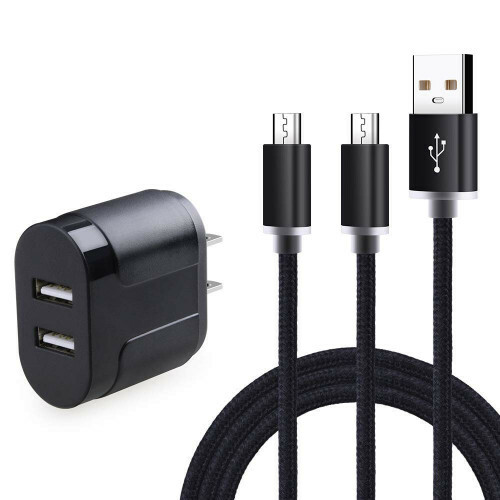 This is the perfect combo for someone looking for HIGH SPEED wall charger and DURABLE Nylon braided Micro USB Cable. Dual-USB output with total current 5V/2.1A and input with 100-240V enables you enough to charge two device together. 1. Premium Aluminum housing and tangle free nylon braided design make the cable durable and prevents it from getting damage during pull and plug. 2. The stainless steel connector heads slot in easily and steadily, and won't get loose or fall out from your devices as your normal micro cables, it can bear 6000+ bending test. 3. Extra long, Extra durable: keeps your devices connected over a much greater distance, replace your cable and add more convenient for play device at home, work or travel. Sony Z3, Z4, Blackberry, TCL, Blackberry, Google, Bluetooth Speaker, Bluetooth Headphones and more android device.